This shimmering collection is the perfect addition to your Thanksgiving table or harvest party. 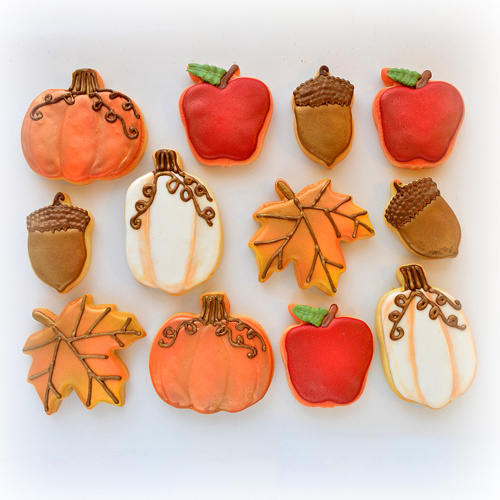 Small Collection (12 cookies): $39 Medium Collection (18 cookies): $60 Large Collection (24 cookies): $75 Extra Large Collection (36 cookies): $110 Available flavors: Orange Vanilla or Rich Chocolate Cookie Sizes: Pumpkin: 3" x 2.75" Gourd: 3.5" x 2" Maple Leaf: 3" x 3" Acorn: 2" x 1" Apple: 2.5" x 2" All cookies are scratch baked and decorated to order. Each cookie is individually bagged in a compostable cello bag and heat sealed for freshness and protection. The cookies are then wrapped in recycled tissue paper and carefully placed in recycled Kraft boxes. Please note all Vignette Bake Shop cookies are decorated by hand and may vary slightly from the photos. These cheery ladybugs are a fun way to say "thanks" or brighten someone's day. 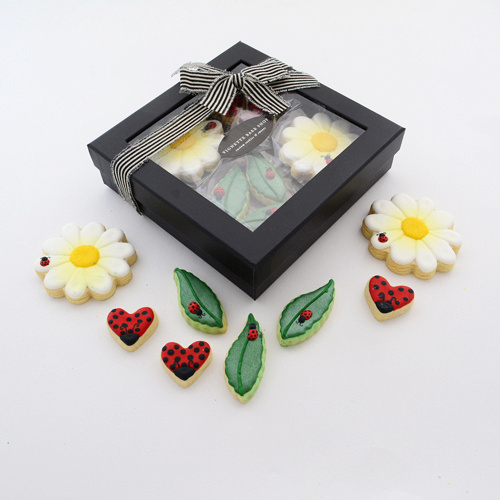 Petite Gift Box (8 cookies): $32 Small Gift Box (16 cookies): $42 Medium Gift Box (24 cookies- 2 gift boxes): $64 Large Collection (32 cookies- 2 gift boxes): $77 Available flavors: Orange Vanilla or Rich Chocolate Cookie Sizes: Round Flower with Lady Bug: 3" Leaves with Lady Bug: 2" Lady Bug Petite Cookies: 1" All cookies are scratch baked and decorated to order. 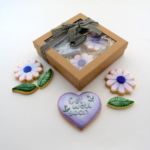 Each cookie is individually bagged in a compostable cello bag and heat sealed for freshness and protection. The cookies are then carefully placed in a luxe window gift box(es), cushioned with shred made from 100% post industrial recycled fibers and tied with a striped natural and black linen bow. Please note all Vignette Bake Shop cookies are decorated by hand and may vary slightly from the photos. 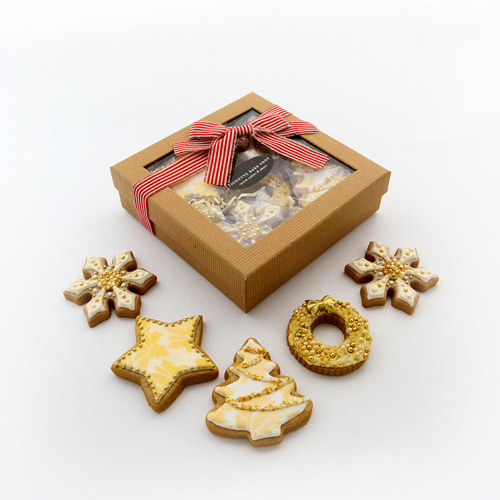 Wish someone happy holidays with this shimmering limited edition Gingerbread Ornaments Gift Box. Petite Gift Box (5 cookies): $30 Small Gift Box (10 cookies): $58 Medium Gift Box (15 cookies- 2 gift boxes): $85 Large Collection (20 cookies- 2 gift boxes): $100 Available flavor: Gingerbread (If you would prefer Orange Vanilla or Rich Chocolate flavors, or would like to change the colors from gold to silver, please submit request via a "custom order") Cookie Sizes: Medium Star: 3.25" Snowflake: 3.5" x 3.5" Christmas Tree: 3.25" x 3.75" Wreath: 3.25" All cookies are scratch baked and decorated to order. Each cookie is individually bagged in a compostable cello bag and heat sealed for freshness and protection. The cookies are then carefully placed in a luxe window gift box(es), cushioned with shred made from 100% post industrial recycled fibers and tied with a striped natural and limited edition red linen bow. Please note all Vignette Bake Shop cookies are decorated by hand and may vary slightly from the photos. 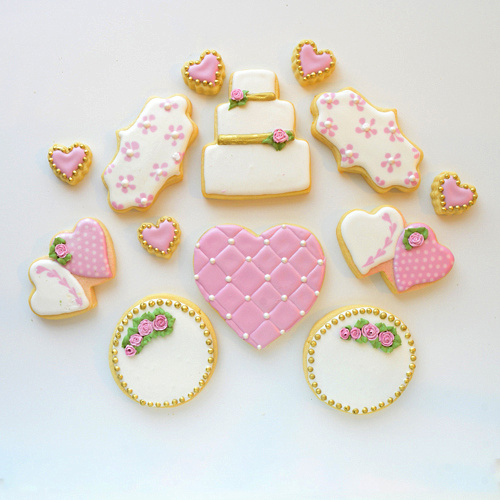 Petite Hearts: 1.5" x 1.25"
All cookies are scratch baked and decorated to order. Each cookie is individually bagged in a compostable cello bag and heat sealed for freshness and protection. The cookies are then wrapped in recycled tissue paper and carefully placed in recycled Kraft boxes. Please note all Vignette Bake Shop cookies are decorated by hand and may vary slightly from the photos. Romantic details make this bridal collection the perfect addition to any bridal shower, rehearsal dinner or wedding event. Small Collection (13 cookies): $49 Medium Collection (17 cookies): $73 Large Collection (26 cookies): $93 Extra Large Collection (34 cookies): $133 Available flavors: Orange Vanilla or Rich Chocolate Cookie Sizes: Heart: 4″ x 3.75″ Double Hearts: 3.5″ x 2.25″ Oval Plaque: 4″ x 2.5″ Cake: 3.75″ x 3.25″ Petite Heart: 1″ Round Rosettes: 3.5″ All cookies are scratch baked and decorated to order. Each cookie is individually bagged in a compostable cello bag and heat sealed for freshness and protection. The cookies are then wrapped in recycled tissue paper and carefully placed in recycled Kraft boxes. Please note all Vignette Bake Shop cookies are decorated by hand and may vary slightly from the photos. A sweet housewarming surprise or the perfect gift for real estate agents or mortgage brokers to send to their clients. 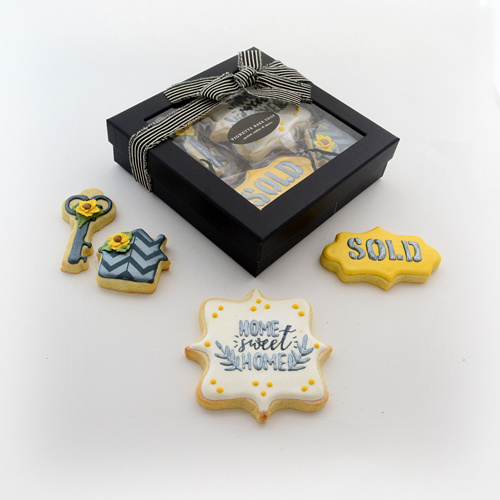 Petite Gift Box (4 cookies): $24 Small Gift Box (8 cookies): $39 Medium Gift Box (12 cookies- 2 gift boxes): $59 Large Collection (16 cookies- 2 gift boxes): $69 Available flavors: Orange Vanilla or Rich Chocolate Cookie Sizes: Key: 3.25" x 1.75" House: 2.5" x 2.25" Plaque "Home Sweet Home": 4" x 4" Oval "Sold" Plaque: 4" x 2.5" All cookies are scratch baked and decorated to order. Each cookie is individually bagged in a compostable cello bag and heat sealed for freshness and protection. The cookies are then carefully placed in a luxe window gift box(es), cushioned with shred made from 100% post industrial recycled fibers and tied with a striped natural and black linen bow. Please note all Vignette Bake Shop cookies are decorated by hand and may vary slightly from the photos. Let someone know they are in your thoughts with this pretty floral and mason jar collection. 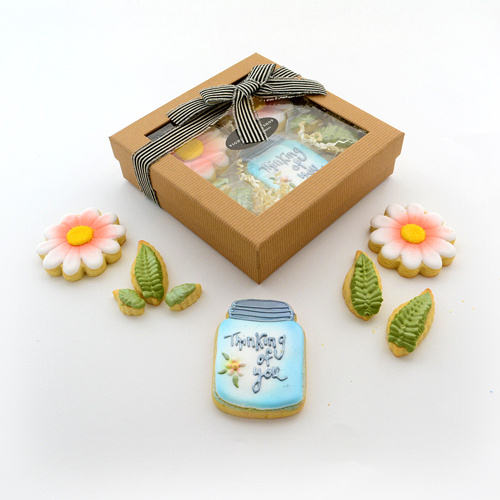 Petite Gift Box (8 cookies): $24 Small Gift Box (16 cookies): $40 Medium Gift Box (24 cookies- 2 gift boxes): $60 Large Collection (32 cookies- 2 gift boxes): $72 Available flavors: Orange Vanilla or Rich Chocolate Cookie Sizes: Daisy Flower: 3" Leaves (3 Large/ 2 Small): 1" and 2" Mason Jar: 4" x 3.75" All cookies are scratch baked and decorated to order. Each cookie is individually bagged in a compostable cello bag and heat sealed for freshness and protection. The cookies are then carefully placed in a luxe window gift box(es), cushioned with shred made from 100% post industrial recycled fibers and tied with a striped natural and black linen bow. Please note all Vignette Bake Shop cookies are decorated by hand and may vary slightly from the photos. 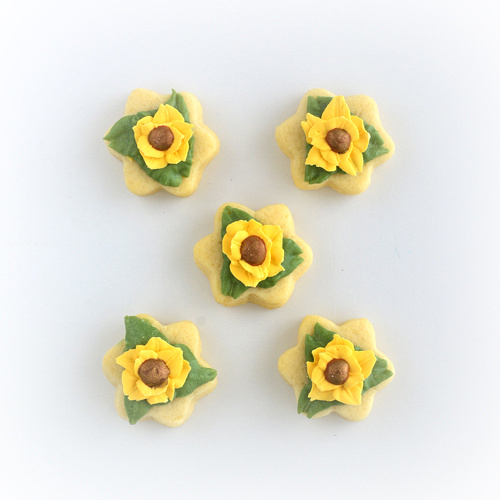 These delicate little sunflowers will be the perfect petite treat to add to an existing collection or to enjoy on their own. All 5 petite cookies are bagged together in a compostable cello bag and heat sealed for freshness and protection. The cookies are then wrapped in recycled tissue paper and carefully placed in a recycled Kraft box. Please note all Vignette Bake Shop cookies are decorated by hand and may vary slightly from the photos. A pretty treat with your morning coffee or afternoon tea, our skinny cookies are a thinner, unfrosted version of our classic sugar cookies. 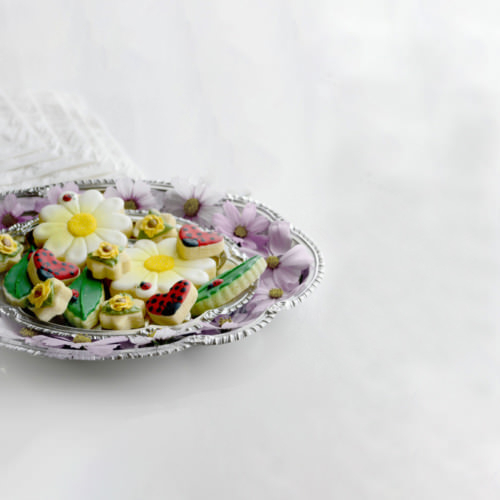 The floral embellishments are created using additional cookie dough in a silicone mold, which is then placed on top the cookie prior to baking. 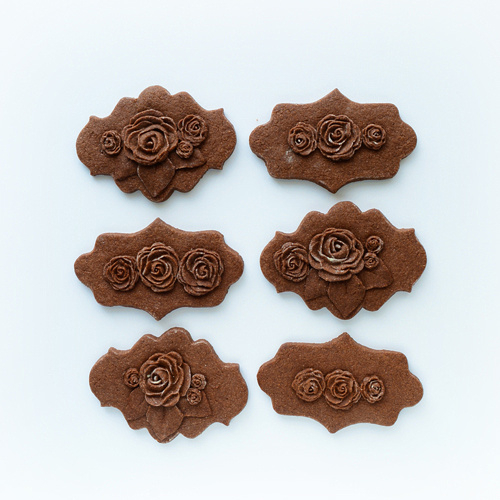 Choose from a floral long fancy plaque cookie (3 roses) or a floral oval plaque cookie (3 roses + 3 leaves) Available flavors: Orange Vanilla or Rich Chocolate Priced at $4 per piece (minimum 6 pieces per order) Sizes: Floral Long Fancy Plaque: 4" x 2.75" Floral Oval Plaque: 4" x 2.5"
All cookies are scratch baked and decorated to order. Each cookie is individually bagged in a compostable cello bag and heat sealed for freshness and protection. The cookies are then wrapped in recycled tissue paper and carefully placed in recycled Kraft boxes. Please note all Vignette Bake Shop cookies are decorated by hand and may vary slightly from the photos. 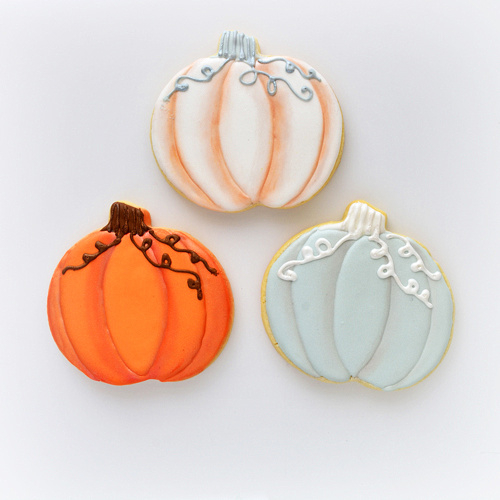 Spice up your next fall party with these festive fall pumpkin cookies! 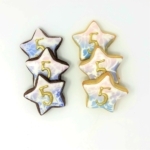 Choose from Orange, White or Silver Sage colors Available flavors: Orange Vanilla or Rich Chocolate Priced at $5 per piece (minimum 6 pieces per order) Size: 3.75" x 3.5" All cookies are scratch baked and decorated to order. Each cookie is individually bagged in a compostable cello bag and heat sealed for freshness and protection. The cookies are then wrapped in recycled tissue paper and carefully placed in recycled Kraft boxes. Please note all Vignette Bake Shop cookies are decorated by hand and may vary slightly from the photos. 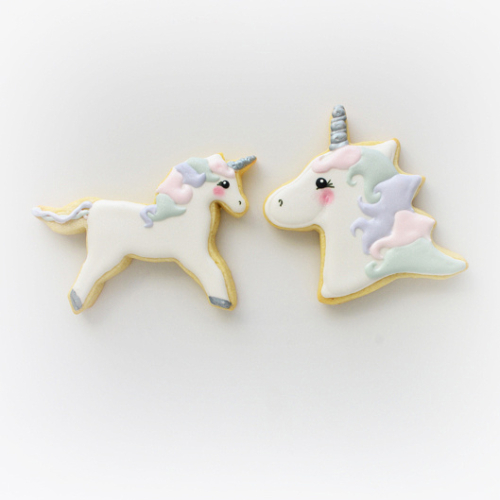 Unicorn Head: 3.5" x 3.5" All cookies are scratch baked and decorated to order. Each cookie is individually bagged in a compostable cello bag and heat sealed for freshness and protection. The cookies are then wrapped in recycled tissue paper and carefully placed in recycled Kraft boxes. Please note all Vignette Bake Shop cookies are decorated by hand and may vary slightly from the photos. Vignette Bake Shop currently ships only within the state of Maryland. 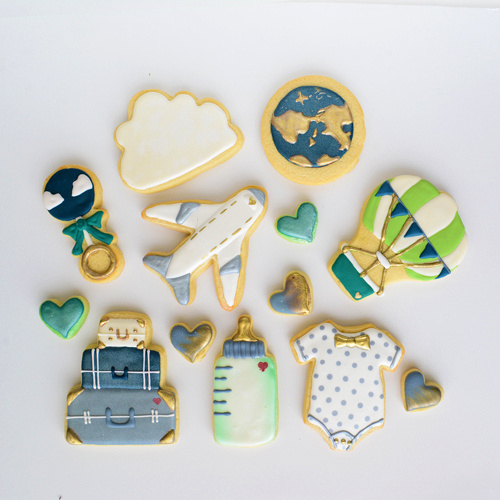 Vignette Bake Shop specializes in creating beautifully handcrafted pieces of edible art using high quality ingredients for each small batch, custom made order.